This is another appetizer which you can enjoy either warm or cold. It's my whimsical creation as I wanted to fix something quickly as an appetizer. 1 ea. 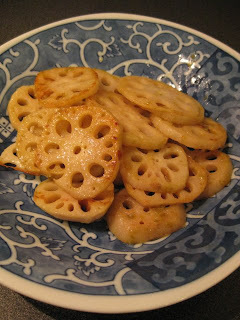 lotus root (about 10 oz), peeled, sliced (about 1/8" thickness), and soaked in cold water for 15 minutes. Pat-dry the sliced lotus. Heat about 1.5Tbsp of olive oil in a pan. Saute the sliced lotus at medium-heat until nicely-colored (both sides). In a ramekin, dissolve about 1 Tbsp (or more if you like it hotter) of yuzu-kosho with the half amount of water. Turn off the heat. Pour the water-dissolved yuzu-kosho over the lotus and toss well. That's it! It's so simple and the taste is great.